In Today’s world, human activities influence virtually every species of fauna and flora almost everywhere in the world. We must manage our wildlife resources, and if we manage our prey animals, we also must manage our predator populations. So predators must be hunted as a necessary management tool, and if you’re going to hunt predators it’s important to use the proper rifle. Predators are a very diverse group. We’re talking mostly about cats, canines, and bears: families Felidae, Canidae, and Ursidae. All vary greatly in size. Extant cats run from the tiny three-pound genet on up to lions and tigers (the latter approaching a half-ton); canines start with very tiny foxes, then through jackals and coyotes, and on to wolves and hyenas, up to perhaps 200 pounds. The ideal coyote gun is not the ideal bear rifle, and the best setup for a bobcat wouldn’t be a good choice for lion or leopard. Few things are more exciting than calling a predator in close. It’s coming in looking for a meal and now the hunter is the hunted! How close the shot depends a lot on terrain and cover. Sometimes it’s very close; other times it’s best to be able to reach out. Either way, the numerous types of foxes present a different situation. They are small animals, lightly boned with thin, fragile hides—and the fur is beautiful. Facing an epidemic of non-native foxes, Australians developed the .17s. They got it right. The idea was that the tiny, frangible bullet would enter but not exit, thus doing minimal pelt damage. The super-fast .17 Remington may be a bit much, but the rimfire .17 Winchester Super Magnum and centerfire .17 Hornet and .17 Remington Fireball are about right. Provided the cover allows closer shots, the .17 HMR is also excellent for foxes. Coyotes present a different problem. Although they are thin-skinned, the biggest difference from foxes isn’t so much size as the fact that these animals are tough—in my opinion, pound for pound among the toughest animals out there. The fastest .17s are fine, but I am convinced the .17 HMR isn’t enough gun. Mild .22s from the rimfire .22 WMR and .22 Hornet are fine up close. In more open country, a bit more gun is desirable, but the goal is still to take the animal cleanly with as little pelt damage as possible. 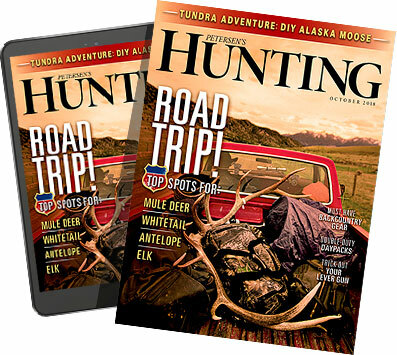 The .204 Ruger and faster .22 centerfires, like the .22-250 and .220 Swift, are obviously fine, but they’re unnecessary unless you’re taking long shots. The perfect cartridges for coyotes are the venerable .222 Remington and the .223 Remington (5.56mm NATO). Developed as a benchrest cartridge, the .222 tends to be super-accurate, but it’s only slightly slower than the incredibly popular .223. Both are deadly for coyotes. With any centerfire, though, it’s difficult to keep bullets from exiting, and that means pelt damage. From the .222 upward, consider using tough bullets with limited expansion, not frangible bullets designed for small varmints. The ideal is caliber-sized entrance and exit wounds. When it comes to most cats, furs are precious and the skins are paper-thin. In a chance encounter, you’ll probably use what you have, and that makes avoiding damage almost impossible. Also, unlike coyotes and jackals, cats are not tough. Shot placement is important, but a lot of power isn’t necessary. On the smallest cats at close range, the good old .22 Long Rifle is fine. The .17 HMR, .22 WMR, and .22 Hornet offer pretty good all-around compromises. If faster, more powerful cartridges are used, choose tough bullets offering minimal expansion but, even then, be prepared for some pelt damage. One of the small cats I wanted desperately was a serval, a bobcat-size African spotted cat. When I finally got a chance, I used what I had, a .375. Being grossly overpowered isn’t necessarily a bad thing. The bullet was designed for animals 20 times larger, so of course it exited, but it didn’t expand and thus did minimal damage. I’m not advocating bobcat hunting with a .375, but if you’re using your favorite deer rifle and chance encounters are possible, consider using hard, tough bullets that will burn through on smaller animals. To say mountain lions (also known as cougars) and wolves are not dangerous to humans is false. There are too many recent documented incidents to believe that. Also, it’s fair to say that calling creates an interesting—possibly dangerous—situation. Any predator that’s in the area might respond, and it will be coming for a meal. It’s foolish to call alone—especially in bear country. Someone should always be watching the backdoor. That said, attacks on humans by cougars and wolves are still very rare, and they almost never happen to hunters pursuing these species. Thus, I think we can include them with the smaller predators because the hunting techniques are similar: chance encounter, calling, and hunting with hounds for cougars; chance encounter, over bait, and calling for wolves. The two animals are similar in size. A huge cougar can exceed 200 pounds and, on the list of the world’s great cats, is larger than the leopard, though not as aggressive. I’m not convinced a wolf can actually reach that weight, but hyenas, hunted similarly, certainly can. Here’s where the situations differ. The cougar is not a tough animal and, like smaller cats, is thin-skinned and lightly boned. In the chance encounter, you will use what you have. My old friend Debra Bradbury had a project to track a cougar on foot. It took her three Wyoming winters, but she pulled it off. Most mountain lions, however, are taken with hounds, which means the shot will be close. My first mountain lion hunt was in British Columbia in 1975. The houndsman had an ancient slide-action Colt Lightning in .25-20—the only time I’ve seen such a rig in the field. 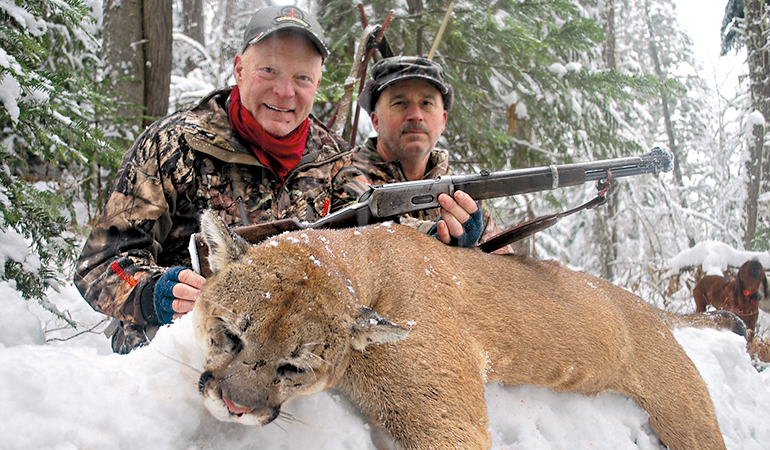 Years ago, gunwriter Bob Milek used a Ruger .22 WMR revolver to take his cougar. So power is not essential. 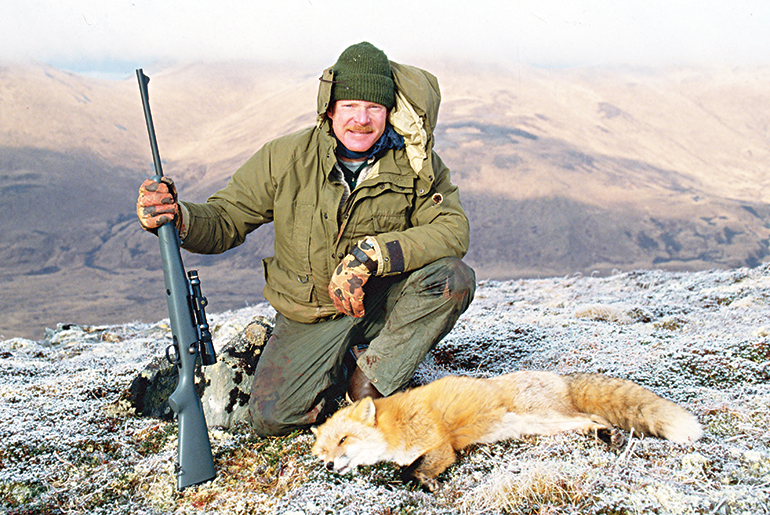 A cougar hunt with hounds is an ideal situation for handguns, archery tackle, whatever, but most houndsmen I know use a good old .30-30 carbine, which is light and easy to carry. There is always a chance a cougar will find a really tall tree or be obstructed by branches, so a light, scoped rifle may be best, but remember to use tough bullets that won’t unzip things on the far side. Wolves are quite a different story. A coyote is tough, and a wolf is at least as tough and three or four times the size of a coyote. They are also the very devil to get a shot at by any method, possibly North America’s most difficult animal. My Alberta wolf-hunting buddy Trent Packham carries a T/C Contender in .223. This little rig has accounted for a lot of wolves, but Trent is a trapper, so that’s what he carries on his snow machine while running his trapline. In the days when aerial gunning was done for wolf control, ARs and Mini-14s in .223 were the most popular. Those are much different situations from “on-purpose” hunting a wolf with the burning desire to take just one. In wolf country always have a tag in your pocket when the season is open. Think deer-sized game and use a deer-sized cartridge with a bullet that will open up and do damage. Also, be prepared to take any reasonable shot you get. The .270 is a great starting point, but the rifle should be well-scoped, accurate, and fast-handling. Northern outfitters will tell you that more wolves are missed than all other species put together. And, yes, I’ve missed shots at wolves. An encounter with a wolf is so startling and so unexpected that it turns you inside out; a shot on a wolf is such a rare opportunity that a miss is a real tragedy.